Biking is one of the easiest ways to reduce our environmental impact when traveling to and from work, school or another destination. But the ease and access to biking in a community depends a lot on design. The design of bike paths and bike storage space are key to the success of this kind of transportation. Twenty or thirty years ago, many schools may have had bike racks that allowed students to safely lock bikes away while in class. But with buses, cars and highway infrastructure currently dominating how we get to school, many bike racks have been removed while greater attention has been paid to building more parking spaces for cars. By riding their bikes to class, college students help to reduce carbon emissions output. Despite this trend, the use of bikes helps to offset the increasing amount of greenhouse gases being emitted into our atmosphere and reduces the emission of other byproducts that come along with the internal combustion engine. In this lesson, students will design a public bike rack and mapping system for their community or school. Students will use basic math and geometry to design a rack made from easy to find scrap or recyclable materials. The goal is to use design-thinking to solve transportation challenges that affect your school community. This lesson is great for math classes, using practical and real-world applications in geometry and measurement. SL.6-8.1. Engage effectively in a range of collaborative discussions (one-on-one, in groups, and teacherled) with diverse partners on grade 6 topics, texts, and issues, building on others’ ideas and expressing their own clearly. Cluster Understand ratio concepts and use ratio reasoning to solve problems. 6.RP.1. Understand the concept of a ratio and use ratio language to describe a ratio relationship between two quantities. Cluster Solve real-world and mathematical problems involving area, surface area, and volume. 6.G.4. Represent three-dimensional figures using nets made up of rectangles and triangles, and use the nets to find the surface area of these figures. Apply these techniques in the context of solving real-world and mathematical problems. Students will come up with designs for a public or private bike rack that can be built and installed in their school or community from recycled or low impact materials. Students will understand the impacts of fossil fuel consumption of cars and other vehicles. Students will understand the role of designer in creating a usable transportation infrastructure that includes many different kinds of vehicles. Students will use real world math and geometry skills to help design or plan for bike racks in their community. Air Emissions: The release or discharge of a pollutant into the air. Livable Streets: Community designs that center around public transportation and walkable, bike-able streets. Open up this lesson with a simple series of questions: "Who here rides a bike?" "Do you ride your bike to school, to the grocery store or around the neighborhood?" "Where do you store and keep your bike?" Talk about transportation in general throughout your region and community. "Is it bike friendly? Why or why not?" "What kinds of design elements deter users from riding bikes instead of driving in cars?" Talk about some of the benefits and problems with bicycle transportation. Conduct a simple survey about your class's opinion about bikes. Create a mind map on the board of reasons why or why students don’t ride to school and other issues brought up through the discussion. As a great history connection, look at the Smithsonian’s online resources for a recent exhibition titled On the Move. There you will find an excellent history of the bicycle from the Smithsonian’s archives: http://americanhistory.si.edu/onthemove/themes/story_69_1.html. Through the examples presented in this exhibition, ask students to think about the evolving design and use of bikes around the world. Each year, the United States produces about 10% of the world's petroleum but consumes about 26% of the world's total production. Cars and light trucks are the single largest users of petroleum, consuming about 43% of the total. Overall, cars and light trucks consume about 16% of the total energy used in the U.S.
• Runoff of oil, dirt, brake dust, deposited vehicle exhaust, road particles, automotive fluids, and deicing chemicals from roadways and parking lots. • Leaking underground fuel storage tanks. • Improperly disposed of waste fluids, e.g. used motor oil. Make sure to connect these issues to your students' personal health and neighborhood. Things like air and water quality affect everyone even if we don’t see it every day. To drive home this point, talk about air quality and asthma in your community and pull out local roadmaps to talk about the urban planning and design of the region. Ask students to consider if your community is “bike friendly.” "Is it easy to ride from place to place using a bike and not just a car? Why and why not?" End your discussion by thinking about how bikes can help to offset some of the environmental problems brought up in the previous discussion. Bikes consume no fossil fuels, do not emit greenhouse gases, are quiet and are healthy for people in terms of exercise. "If more people used bikes in your town or city how would this impact your local environment?" Now have students investigate their school and community at large. Find out if any bike racks are located on school property or can be found in nearby neighborhoods. Ask students to map where these bike racks are located. Extend your initial survey school wide and see if any students/teachers ride to school. Why or why not? As a class create a list of barriers alongside some potential solutions to making bikes more popular in the school. To make a statement about the need for more bike use in your area, students will now be challenged to design a bike rack for their school. NYC Hoop Rack - One simple way to encourage increased bike use in urban areas is to provide bicycle lanes and parking in both commercial and residential locations. A study has shown that a lack of secure bike parking is the main reason why people do not cycle to work. In 2008, New York City’s Department of Transportation, in partnership with Cooper-Hewitt and with the support of Transportation Alternatives and Google, organized an international competition for a sidewalk bike rack. 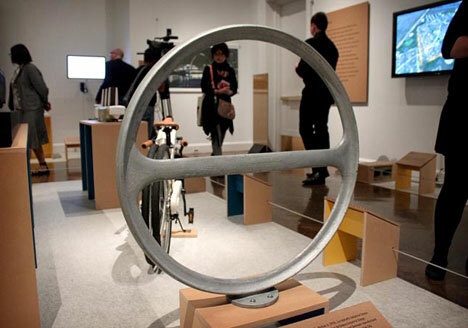 The winner was the NYC Hoop Rack, created by two designers in Denmark, Ian Mahaffy and Maarten de Greeve. This elegant, no-fuss, minimal design will become the new standard bicycle rack on the city’s sidewalks. Over the next three years, five thousand racks are expected to be installed citywide. The Hoop Rack, a 34” circle made of cast metal and bisected by a horizontal bar, can withstand the harsh environment of city streets and is destined to become an iconic member of the urban streetscape. Ask students to think about how the design of the rack will affect its street presence and usability. Another great resource found in the Cooper Hewitt Smithsonian Design Museum's Design Triennial’s Catalog is also the IF Mode Folding Bicycle, which is made of lightweight materials, eliminates oily chains, complex tubes and has full-size wheels. According to the designer Mark Sanders, “Instead of looking at the bike and thinking of how to fold it, it began with the folded shape and thinking of how to turn it into a bike.” Furthermore, as mobility systems become increasingly interconnected, portable designs like these will facilitate transfers between different modes of transportation. Like laptops, they might eventually become a standard piece of one’s luggage. Divide students into design teams and challenge each team to develop a bike rack for their school. What would it look like? Give students some basic measurements to work with. What is the basic size of a bike and how big would the rack need to be. 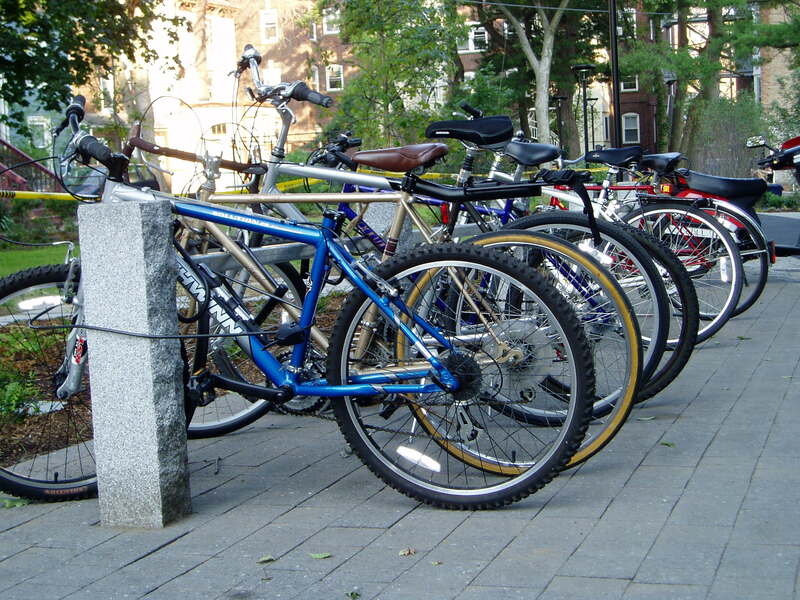 As a class determine a location where the bike rack, or where an additional or expanded rack, may be installed. Ask the principal for approval before starting this process. Each group will generate sketches and use basic geometry to develop proper dimensions of their bike rack. Start with a top view sketch, followed by a side view and isometric sketch (3D drawing a 30 degree angle) of the bike rack. Use rulers, compasses and other equipment to help students create a detailed design and sketch of their bike racks. Use relevant math lessons to help students think about ratios (and fractions) to build a model or actual prototype. "Most bikes are about five feet in length and less than a half foot in width (not counting some larger handles). If you need to store 10 bikes at your bike rack and each needs at least 1 foot for spacing – what would the total length and width of your bike rack system be?" "Can you think of another design that would reduce the length of the bike rack by 15% without affecting the number of bikes the rack can hold?" After a 20-30 minute design session, have each team finalize their designs. If possible, as a class build a prototype or model of one of the team’s proposed bike rack. Find scrap wood or use an old palette. Have someone from the community conduct a woodworking tutorial in your classroom. Have students measure pieces of the bike rack and have an adult or volunteer cut each piece of wood. Work with your principal to find a place on campus where the bike rack can be properly installed. If you can’t find time or materials to build a full-scale prototype, use pipe cleaners and wood sticks to develop models that are to scale. Share your bike rack designs with the school community. If time allows – develop a concept for a bike system around your community. "Where would more bike racks need to be installed?" You’ve spent time learning about how biking can help the environment. But can you think of ways that biking would help you? Can you think of instances when biking to and from a destination wouldn’t be possible? Can you estimate the number of bike racks that would have to be installed if everyone at your school used bikes to get to class? Would you ride a bike more often if you had a place to keep it locked up around town? Bring a bike to the classroom and discuss different ways to keep it locked and secure. Challenge students to bike to school with a parent/guardian one day and discuss their experiences as a class. Older students can conduct in-depth research on the environmental effects of commuting to school by cars. In addition, the health benefits of biking can be studied. Using this research, students can educate others in the community on the benefits of bicycles and collaborate to design a bike-to-school/work awareness day. Students can survey other students, administrators and community members about the challenges of biking to school or work. Each design group can choose a "client" to design a bike rack for (i.e. principal, teacher, student), focusing on their particular needs and challenges in their designs.